Tardis leaving Suntex for the great beyond. As a young man I devoured all the books of the great solo circumnavigators — Slocum, Chichester, Aebi, Guzwell and the greatest of them all, Sir Robin Knox-Johnston. 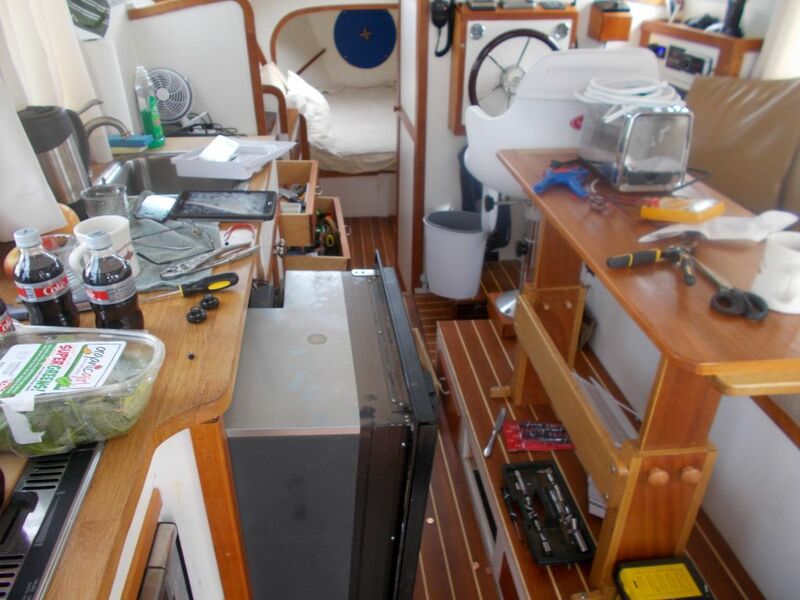 Although life choices and the fact that I am a pretty timid sailor took me in other directions, doing the 6000-mile Great Loop (always with crew) whetted my appetite to go long distances. So I set up Tardis to go those distances on her trailer, then by water with me as sole crew so Molly or John or whoever wants to join the Tardis can do so, but if I have to get from port to port by myself, so be it. The test of all the boat’s systems (and Captain-crew-navigator me) has been a trip up the Intercoastal Waterway from Vero Beach to Jacksonville to pick up John who is south for some vacation. There could be no easier test — if anything goes wrong on the ICW, you just wind up on a mud bank and wait for TowBoat US. There is virtually no open water or chance of wave buildup. Marinas line the waterway as do anchorages — pull out of the channel and lower away. 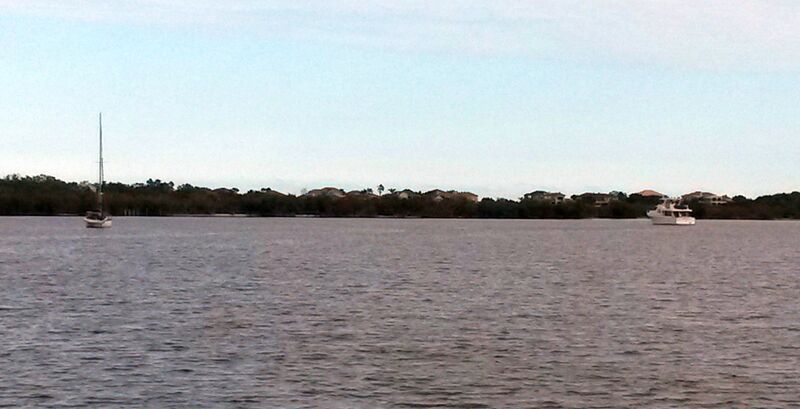 Day one was to be an anchorage –Honeymoon Lake, between Cocoa and Melbourne. 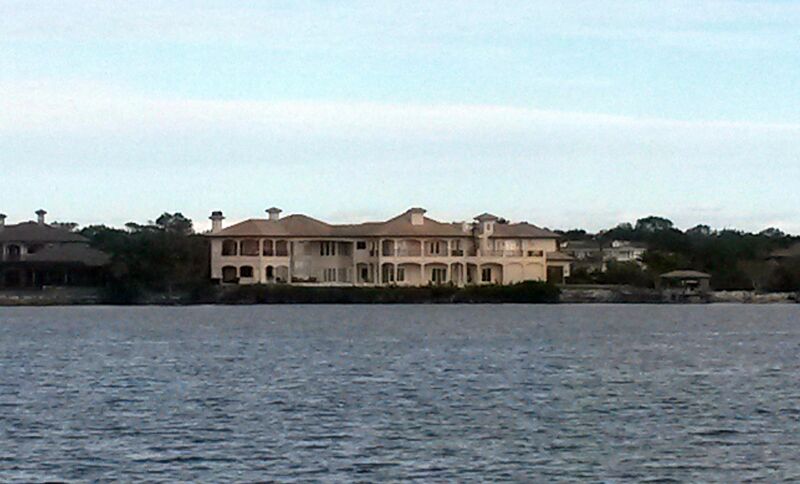 The actual lake is in a nature preserve ashore, but a little inlet has carved out a big, well-protected anchorage. There are no services ashore, so very few boats. Never having anchored on Tardis before, I wasn’t totally sure I could get 50 feet of chain and my trusty 25 lb. Delta back on the boat once anchored, although I had practiced at the dock. So I needed lots and lots of room in case of trouble or exhaustion. After a beautiful night with two other boats way off in the distance, the anchor came right up clean and I wasn’t overly tired. Next just harbor-hopping up the coast to Titusville, for my third trip to the Kennedy Space center, since I had never seen the new Space Shuttle building. Daytona was next to stay at beautiful Halifax Marina (500 slips and all the trimmings), then St. Augustine and a trip to the airport to pick up son John. St. Augustine is a favorite stop. It is a great mix of history, great restaurants, shopping and of course, minigolf, tourist trains and Ripley’s Believe It Or Not. The test here was whether I could manage docking, undocking and gas docks without too much damage to Tardis or other boats. So far, so good. My boathandling is getting much better, and with full tanks and supplies Tardis sits exactly on her lines and doesn’t blow around as much. Performance has been outstanding — burning 3.5 gallons per hour at 10-11 knots. Tardis is so much faster than Memsahib, that I really don’t get tired, since what would have been an 8-hour slog Daytona to St. Augustine is now an easy 5. I could do 60 mile days easily in Tardis if I wanted to. One adventure: Tardis does not have a remote oil tank for the oil injection system, and only holds maybe a quart in the engine. Getting to the engine oil fill is a pain requiring removal and reinstallation of a very tight cowling. I thought I had plenty of oil, but a half-hour out of Daytona got a low oil warning. The only thing I could do is pull off the ICW and anchor, using as little chain as possible. The cowling came off cleanly for once and I had the oil filled in less than five minutes. But I was pretty close to shore and it was blowing abut 15 knots, so getting the anchor in and secured and then for me to get back down the forward hatch to the helm was going to be tricky. So I pulled it as hard and fast as I ever have. The anchor came right into the roller, I dived down the hatch and hit the gas and we got away with room to spare. But I was really tired: a remote oil tank and windlass are certainly in the future. Day-to-day anchoring I can handle, but I want to be able to get the hook up fast when I have to. I added a hose holder to the engine cover to store the shore-power line which always seemed to be in the way. 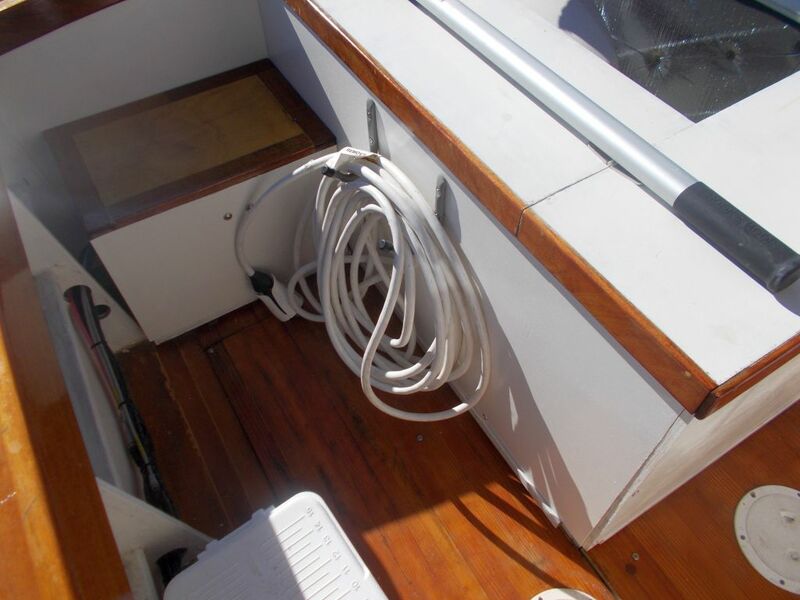 I installed some waterproof quick connects to the anchor light wiring so I can take the mast off quickly for trailering. The fridge quit, and it took two days to troubleshoot. Based on the manual, I thought it was the thermostat, but a replacement ($94) did not solve the problem. I found a number for the manufacturer (Webasto) and tech rep Doug Burnette walked me through every conceivable test. We finally thought it was the electronics control package, so they sent me a new one for free. Installation was a nightmare — tiny inaccessible screws, parts buried in insulation, the wrong type of connector on one of the wires, which I believe caused the electronics unit to think there was a short in the fan and shut down. So I rewired from scratch after a long trip to West Marine for parts. 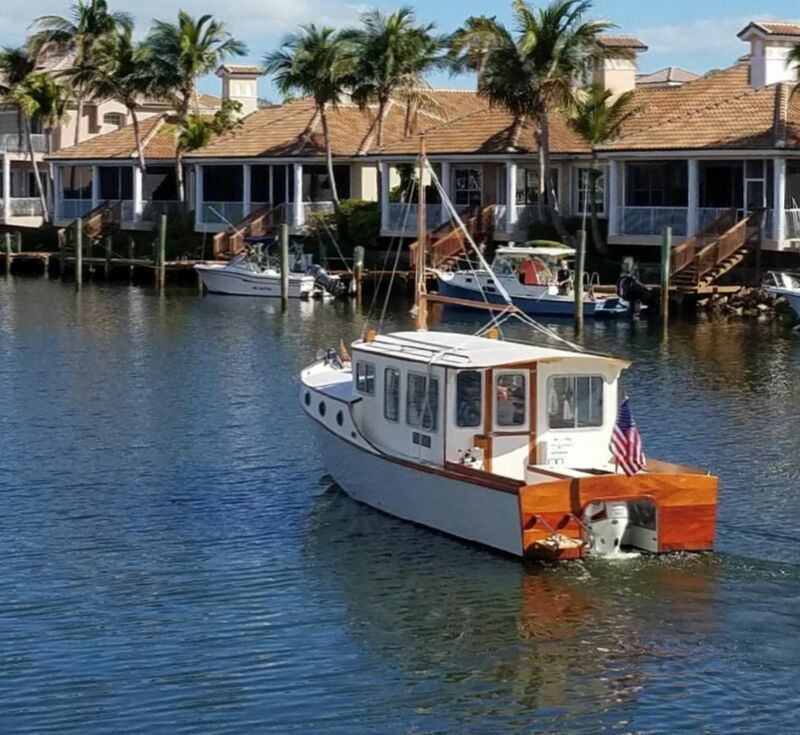 John and I are heading back to Vero for the weekend, then back on the trailer Monday, then back to Connecticut. Chadd will pick up the boat whenever. It has been clear but quite cold (for Florida), but I refuse to complain about the weather give the incessant Noreasters back home. Welcome to all the new followers who have seen the Jamestown Distributors article (I haven’t!). Our neighbors at Honeymoon Lake. 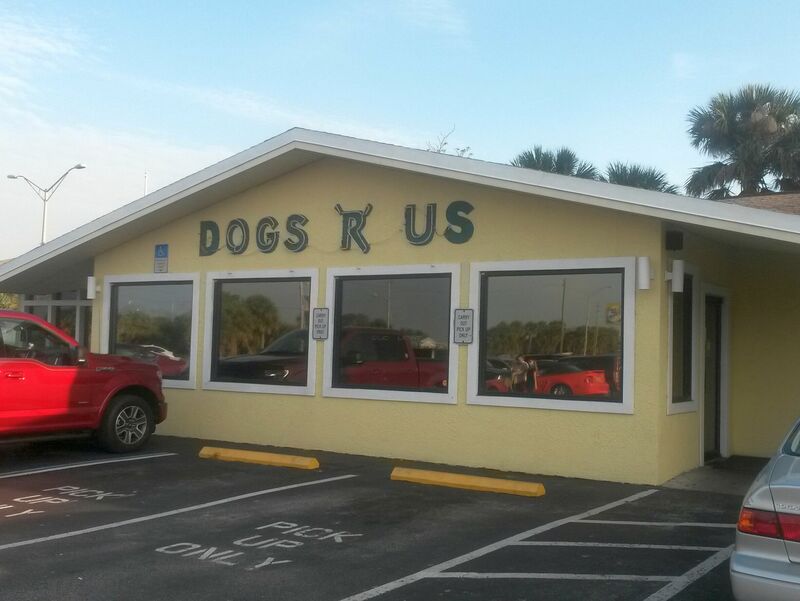 Fine dining Titusville-style. It wasn’t bad — I like dogs. 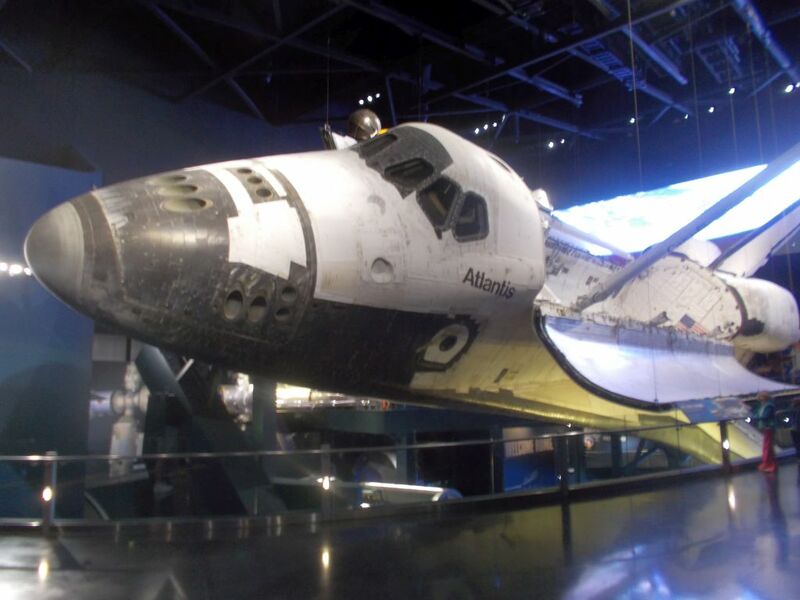 I can’t resist one travelog picture — the last space shuttle Atlantis. 33 missions over 26 years. 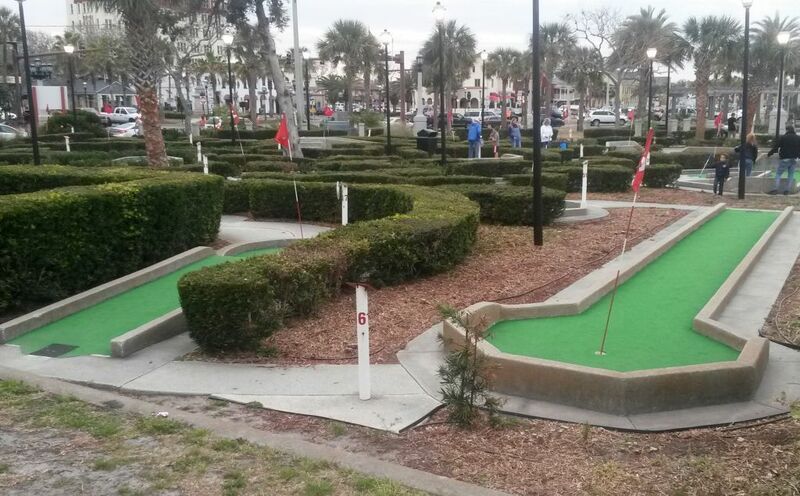 St. Augustine Municipal Marina’s finest asset — a minigolf course. 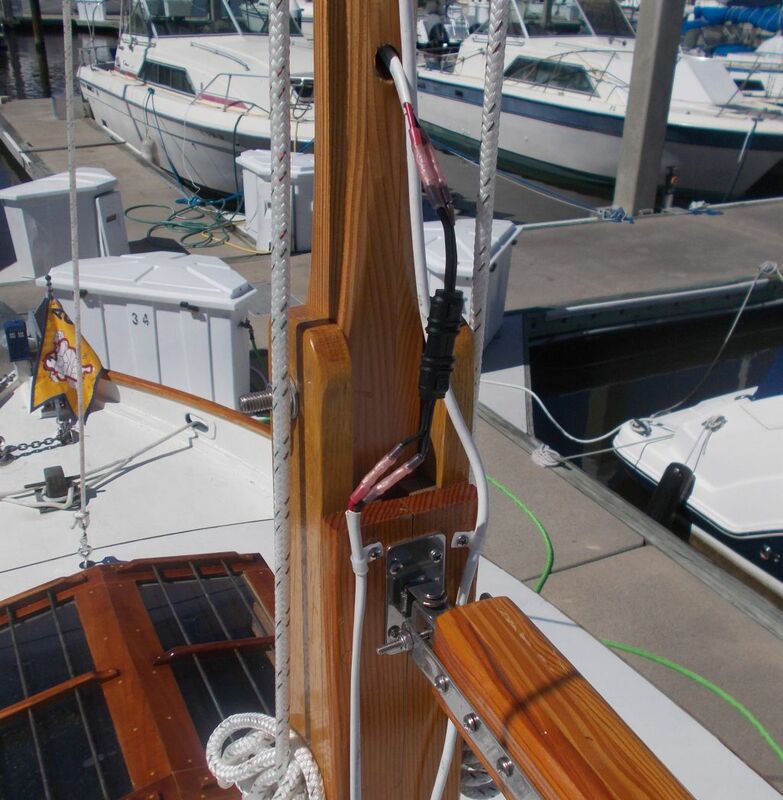 Quick connects to make mast removal easier for trailering. The fridge project. Once again, it seems like every tool on board got used.